2 The one who enters by the gate is the shepherd of the sheep. 3 The gatekeeper opens the gate for him, and the sheep listen to his voice. He calls his own sheep by name and leads them out. This week I received the college magazine of Lakeland College, which is located near Sheboygan, Wisconsin. My name was on the mailing label. “Not again!” I muttered. You see, I graduated from St. Olaf College (I won’t tell you the year), so obviously the people in the alumni office at Lakeland had made a mistake. You might reason that I’m on their mailing list because one of my children had attended Lakeland College. No, their alma maters – their undergrad alma maters that is - included St. Olaf College, Wheaton College, James Madison University, Minneapolis College of Art and Design, and the University of Minnesota, but not Lakeland. My husband went to Northwestern University. Okay, perhaps it was a mailing to introduce me to Lakeland College? They do offer adult education classes. But no, that isn’t the answer. I have been receiving a variety of mail from Lakeland College, addressed to me, for more than 25 years!!! I checked to see if there was another Cathy Conger that went to Lakeland College and there was not. It makes me wonder if Lakeland College really knows any of their students! Have you ever felt that you were just a number? Has someone who should know better misspelled or mispronounced your name? My mother tells the story about how my father’s new boss (back in the 1950s) after being introduced to my mother as Marcella, called her Marsha instead of her name. Mom said she was too intimidated by him to correct him the first several times he made the mistake and later on didn’t want to embarrass him with a correction. Then my parents built a house just a few blocks away from Dad’s boss. The two couples frequently saw each other socially and my sister and I played with their boys every day. To make a long story short, the boss called my mother Marsha for over 50 years, despite years of hearing others calling her Marcella! Mom said that it always hurt her feelings just a little. No kidding! God knows my name! He knows yours too and He never forgets us. I may never convince Lakeland College that I am not in their book, but I rejoice that God knows I belong in His book of everlasting life. 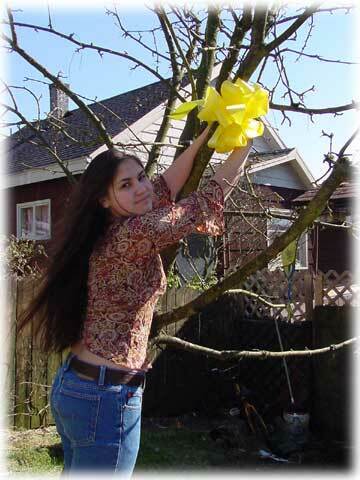 I’m sure you are familiar with the yellow ribbons that have been tied around trees in the yards of families when their loved ones fighting overseas are being held prisoner. Perhaps that custom began during the Vietnam war. I’m not sure, but I definitely recall seeing them during the Iran hostage crisis when the American embassy staff in Iran was held hostage for many months. The people who loved those being held hostage tied these yellow ribbons around the trees in their yards - and they wouldn’t take them down. The yellow ribbons were a symbol of their hope that the one they loved would be back home. And when those hostages finally did come home, man, there were yellow ribbons everywhere! 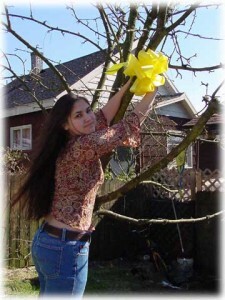 Perhaps you once had or presently have a yellow ribbon tied around a tree in your front yard. I pray God will return your soldier home to you safely. However, nearly all of us have someone we love who is a prisoner of a different kind of war - the spiritual war that is raging for every soul, the battle between Christ, the life-giver, and Satan, the life-taker. It could be that someone you care about is, in a spiritual sense, being held as a prisoner of war by the enemy - someone who doesn’t know Christ, or maybe someone who once knew Him but has drifted away. Either way, it might seem to you as though that person is never going to come around. Like those people who hung those yellow ribbons, you need to keep your hope alive for the return of the one who’s a spiritual captive right now. I can say that boldly because of something Jesus himself said in Matthew 18. Jesus is in pursuit of the one you love who is away from Him. Active pursuit. Aggressive pursuit. He is, as that classic poem by Francis Thompson says, “the Hound of Heaven”. The major instinctive characteristic of a bloodhound is that it fixes its focus on an animal or person who is lost and pursues it until it is found. Even though your loved one doesn’t know they’re a prisoner, even though their heart seems to be getting harder and harder, even though the battle for their soul has gone on for a long, long time, Jesus knows how to bring that dear one home. He is moving people and circumstances around so they will end up face-to-face with Him. But recognize it is He who will bring them home, not you. You just keep loving them, just keep believing God for them, just keep praying for those divinely-orchestrated circumstances to be successful, and don’t try to pursue them yourself with spiritual nagging, something I must bite my tongue often to keep from doing. And don’t take your yellow ribbon down! Don’t give up hope. There may not be much visible reason for hope, but your hope is based on the promise of the most powerful Person in the universe - that He is passionately pursuing that one that you love. The rescue team has been dispatched from heaven on their behalf. You can’t see what God’s doing, but you can be sure He is throwing everything into the rescue operation that you’ve prayed about so many times. After the days of heartache and waiting, trust God for that glorious day when the prisoner of war you love will be gloriously welcomed home.